In an earlier post (Political Classical Music in the Twentieth and Twenty First Centuries, posted on March 20, 2013) I discussed a project in which I would identify what I have deemed significant works in this genre. I have decided to narrow the topic to those works which are inspired by or are intended to express dissatisfaction with given sociopolitical issues. This will then leave out works which are friendly to the political situation such as Aaron Copland‘s ‘Lincoln Portrait’ and ‘Fanfare for the Common Man’. These are both great pieces of music but their presentation is more celebratory than critical. So without further discussion (a proposed taxonomy of classical political music will be discussed in a future blog post) I wish to present another blog in that series. The work up for discussion is the large set of piano variations composed in 1976 for the pianist Ursula Oppens. 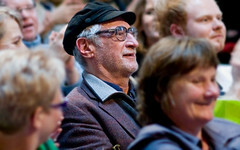 Rzewski is well known for his virtuosity and for his support of and definitive performances of new music. He is also known for quite a bit of music with political themes. Some of those other works will likely be the subjects of future posts in this series. Rzewski took as his starting point a popular song by Sergio Ortega (1938-2003), a Chilean composer and pianist. He wrote the song in 1973 with lyrics written by members of the musical group Quilapayún who subsequently recorded it. Quilapayún recorded no less than 26 studio albums from 1966-2009 along with several live albums. They are a part of the Nueva Canción Chilena which sought political change through new songs defining those changes. The Nueva Canción movement became a subset of Latin American and Iberian folk-inspired protest music which saw groups form worldwide producing songs which became part of the soundtrack of political protests in those various countries. After the 1973 coup which deposed and likely assassinated Salvador Allende the song was popularized also by another Chilean group, Inti-Illimani. Both groups along with many political dissidents sought and found asylum in other countries. Inti-Illimani found refuge in Italy, Ortega and Quilapayún settled in France. This major opus was written on commission for Ursula Oppens who asked for a companion to the Beethoven Diabelli Variations, certainly a tall order. Rzewski wrote the piece in 1975 no doubt inspired at least in part by the 1973 coup which deposed Salvador Allende and installed the dictator Augusto Pinochet. The piece consists of 36 variations grouped in 6 sets of 6 variations each. In a nod to Bach’s Goldberg Variations the final variation is a restatement of the theme. In addition to the main theme there are quotations from an Italian socialist song, “Bandiera Rossa” and “Solidarity Song” with words by Bertold Brecht and music by Rzewski’s former teacher, Hanns Eisler. Oppens premiered the piece on February 7, 1976 at the Bicentennial Piano Series at the John F. Kennedy Center for the performing arts in Washington, D.C. She made a grammy nominated recording of the work in 1979 and the piece has enjoyed numerous subsequent performances and recordings. The piece is structured symmetrically in six sets of six variations each. It also allows for a bit of improvisation. But this is an eminently listeninable piece which seems rightfully to be gaining its place in the repertoire. This is evidenced most recently in Sony’s decision to include this set of variations along with those of Bach (Goldberg Variations) and Beethoven (Diabelli Variations) in a boxed set which I reviewed here. Rzewski himself has recorded the piece four times (1977, 1990, 1999 and 2007). The last recording is a video of the performance. Having seen Rzewski perform this piece live in 1989 I can tell you that his performance is a pleasure to behold. Several other pianists have released recordings (not counting several good ones on You Tube) including Marc-Andre Hamelin, Stephen Drury, Kai Schumacher, I look forward to other recordings hoping to hear interpretations from Sarah Cahill, Bruce Brubaker, Lisa Moore, R. Andrew Lee and Nicolas Horvath to name a few. Whether this work had any impact on the atrocities of the repressive Pinochet regime is certainly doubtful but the fact that this piece has essentially entered the repertoire for virtuoso pianists and stands as a monumental achievement in the variation form will pretty much guarantee that the atrocities and their perpetrators will be recalled and hopefully reviled at each and every performance.